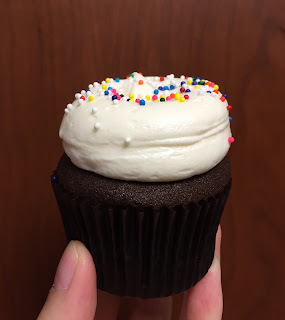 This is another flavor that my husband bought with Vanilla Butterfly Surprise Cupcake from Georgetown Cupcake. 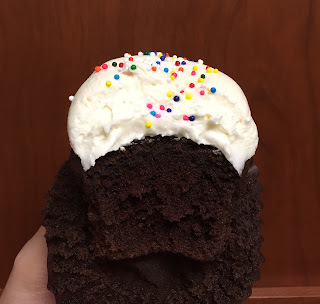 Mother's Day Chocolate Cupcake was chocolate cake topped with white frosting. The chocolate cake was fluffy and lightly bitter, and it's very good. 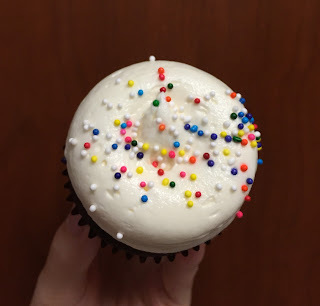 However, the frosting was too sweet and we scraped it off after a bite. I looked the cupcake up online and the HP says that it comes with "baby pink vanilla buttercream vanilla frosting with a gold fondant heart embossed with MOM," but actual cupcake they put in the box something completely different. I wish they're careful what they're putting in the box every time they take order. They didn't even show the contents so that there's no way that he could check or even thought they'd screw up. 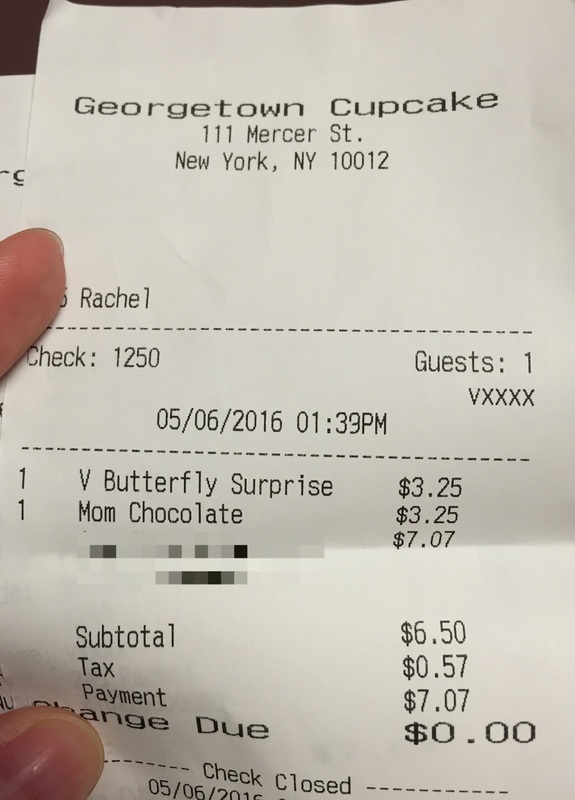 The receipt clearly says, "Mom Chocolate," morons. When I contacted them, the answer was the following. 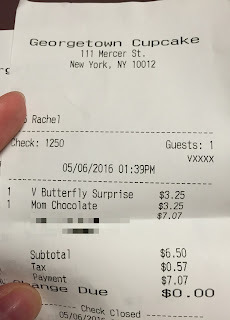 "I am very sorry you had this disappointing experience with our shop! Sometimes it gets very hectic in the shop and mistakes like this happen. As noted in the "Mom Chocolate" description, it is a chocolate cake with pink-tinted vanilla buttercream, while the chocolate birthday is a chocolate cake with vanilla buttercream frosting and rainbow sprinkles. I know this is not the point, but they are essentially the exact same cupcake and will taste the same, minus the color and sprinkles." At least the person said "sorry," but then all I saw was a long excuses, and though the flavors are the same, it's not my point, like the person even noticed. The decoration matters and makes the cupcake special, distinguished, and more valuable, especially if it's a limited version. They totally lost my trust and I'm quite disappointed by the mistake and the justification that mistakes do happen there. 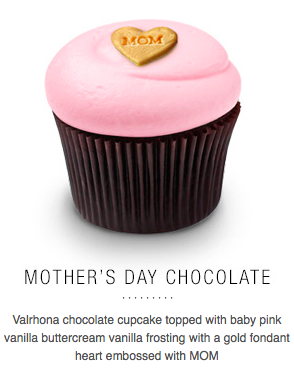 Mother's Day Chocolate Cupcake: 3.25 dollars (before tax) <--- but they put wrong cupcake and it's a Birthday Chocolate.